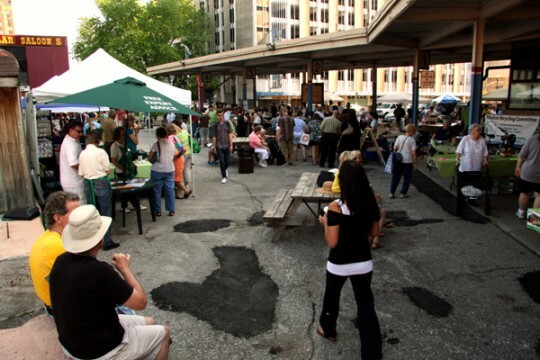 Opening day of the 2010 season for the Downtown Windsor Farmers' Market. The Downtown Windsor Farmers’ Market is in it’s second year, and if you haven’t gone yet, you’re missing out. Not just on some great deals on super fresh, local fruits and veggies, but on a clearly significant shift in the downtown core’s disposition. Every Saturday from 8am to 1pm, a community sprouts up at the old bus station on University Avenue, one that resides in stark contrast to the gray, desolate parking lot that you see there throughout the week. Halfway through the 2010 season, and the market is meeting obstacles. Despite the enriching food and feel the market offers downtown residents and visitors, city council has denied the market’s volunteer committee the opportunity to continue in their present, perfect location. The market has asked to lease the former bus station for five years, but the city won’t allow it, for fear of having to say no to a future developer, and with concern for the loss of surface parking. Not only does this denial deliver a blow to the market’s confidence, but it restricts the market committee’s ability to apply for funding. Funding that could be used to restore the bus station building to it’s former art deco, 1940’s glory. 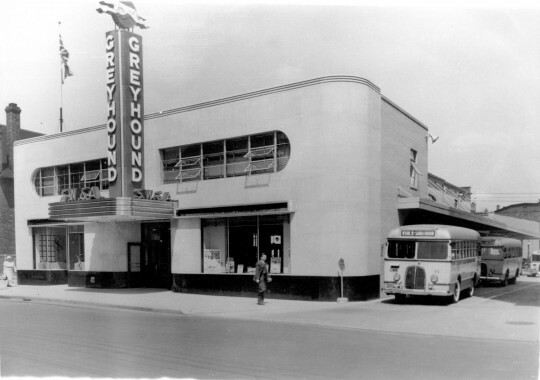 The former bus station, as it looked in the 40s, when it was known as the SW&A Bus Terminal. “We need to build up support and show the City that this is an important part of the core that should be addressed promptly. We need time to plan for the future or there might not be a market next year,” says Natalie Bownes, market co-chair. The market committee is asking the community for support on this issue. Contact your city councilor and tell them of your experiences at the Downtown Windsor Farmers’ Market. Let them know that impeding the market’s progress would show a distinct lack of concern for the small, independent businesses of Windsor. It’s an election year, and public pressure will make a difference. Besides contacting your councilor, what other measures can we take to save the market? The first and easiest step is to spread the word. Tell your friends and family about the market, and bring them along the next time you visit. Let people on Facebook know that you plan to check out the market on Saturday morning. Tell the vendors how much you appreciate them being there. Spread the love. What else can we do, Windsorites? Offer up some suggestions in the comments.